TillVAS holds its James IV Memorial Lecture on Sunday 7 October 2018 at 2.30pm. Dr Alex Hildred, Curator of ‘The Mary Rose’ Trust, will speak on “Henry VIII’s Mary Rose – From Seabed to Showcase”. 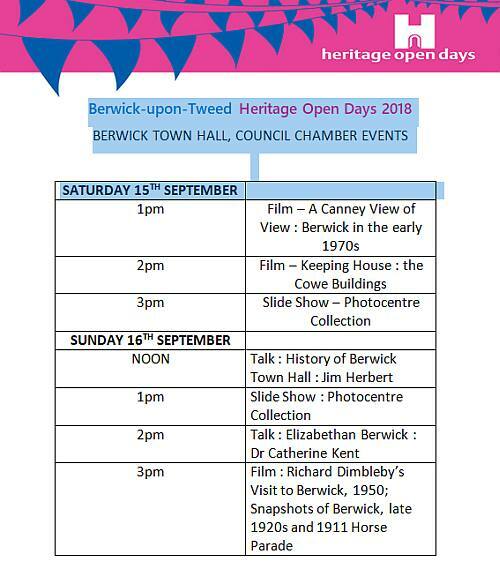 Berwick’s Heritage Open Days for 2018 will be held on 14th-16th September, when over 30 events will be taking place in the town. These will include a selection of open buildings, some historical walks and talks, and a photographic exhibition and other activities in the Guildhall – all free of charge. They are part of a national event taking place all over the country to celebrate local history and culture.